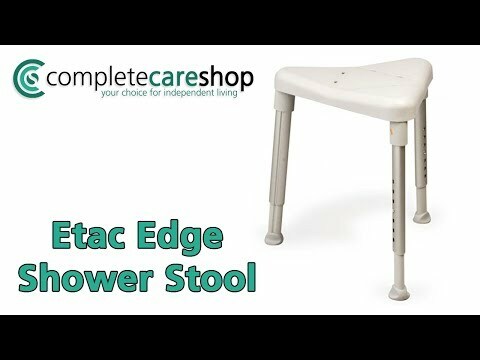 Etac Edge Padded Shower Stool - Blue. This is the Blue version of the Etac Edge Padded Shower Stool, a compact and high quality padded shower stool that is shaped to fit neatly into the corner of the shower cubicle. The Edge is a comfortable, height adjustable, triangular shower stool that fits perfectly into a corner, taking up very little space. The stool features a stable, contoured and comfortable seat that is supplied with a detachable seat pad that gives the user a truly comfortable seating experience. The seat pad has a non-slip surface for improved user safety and is water resistant for easy cleaning. It is possible to turn the stool, offering a variety of seating positions, with the possibility of alleviating hip pain by sitting on the stool in the saddle position. The Edge shower stool stands firmly on all three legs thanks to its built in flexibility and the legs are also slightly angled outwards to further increase the stools stability and safety during use. The sturdy three-legged design eliminates wobbling, whilst the soft, contoured triangular seat promises both security and comfort whilst showering. The non-slip upper surface has small drainage holes that allow water to escape freely without any risk of nipping or trapping the skin.